KABUL, Dec. 15 (Xinhua) -- China, Afghanistan and Pakistan reached broad consensus on trilateral cooperation during the foreign ministers' dialogue between the three sides, Chinese State Councilor and Foreign Minister Wang Yi said here Saturday. Wang made the remarks when speaking to the press after attending the 2nd China-Afghanistan-Pakistan Foreign Ministers' Dialogue in Kabul. Firstly, the three sides agreed to make use of the foreign ministers' dialogue and relevant mechanisms to strengthen coordination and communication in planning and promoting trilateral cooperation in various fields, Wang said. Secondly, amid important opportunities in Afghanistan's reconciliation process, the three sides are willing to strengthen coordination and push for the Taliban's early return to the negotiation table and reintegration into mainstream politics, Wang said. 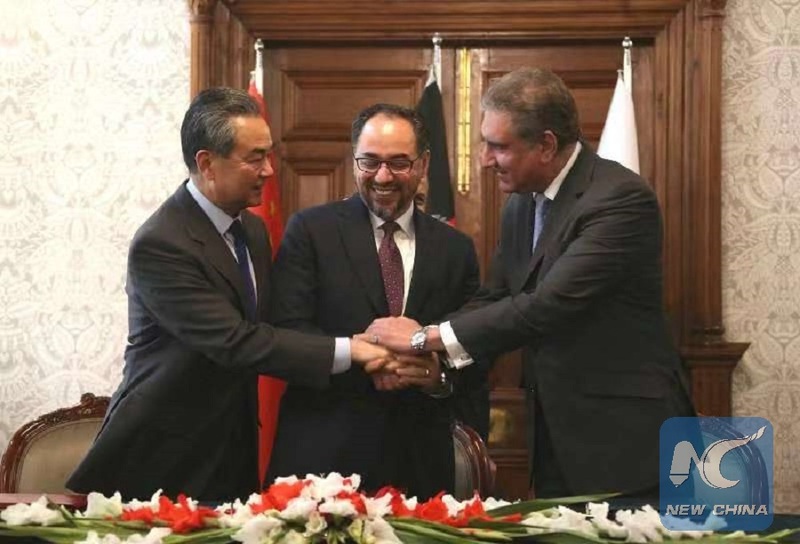 Afghanistan is willing to continue push forward the peace plan and push for the resume of peace talks, while China and Pakistan firmly support the Inclusive Afghan-led and Afghan-owned reconciliation process, he said. Thirdly, Afghanistan and Pakistan agreed to further improve bilateral ties, implement the Afghanistan-Pakistan Action Plan for Peace and Solidarity, boost positive interactions in political, military, economic and security fields, handle disputes through friendly consultation, and properly manage temporarily intractable differences to avoid undermining the improvement of the bilateral ties, said Wang. Fourthly, the three sides committed to a tightened trilateral cooperation, promising to explore possibilities for projects regarding people's livelihood and transportation infrastructures, on the basis of personnel exchanges and training, Wang said. Fifthly, the three sides agreed to promote the construction of the China-proposed Belt and Road Initiatives in a bid to boost regional connectivity and economic development, said the Chinese top diplomat. China and Pakistan supported Afghanistan to make itself a regional pivot by giving a full play of its geographical advantages and to benefit from regional cooperative projects including the China-Pakistan Economic Corridor, he noted. Sixthly, the three sides also vowed to implement the newly signed Memorandum of Understanding (MoU) on Counter-Terrorism, enhance dialogues on counter-terrorism policies and push forward pragmatic counter-terrorism cooperation, while taking a strong and firm stand against terrorist organizations including the East Turkestan Islamic Movement, said Wang. China would offer support and help to Afghanistan and Pakistan regarding counter-terrorism causes and cooperation, he added.